Sigma and pi bonds are chemical covalent bonds. Sigma and pi bonds are formed by the overlap of atomic orbitals. Sigma bonds are formed by end-to-end overlapping and Pi bonds are when the lobe of one atomic orbital overlaps another. Both acquired their names from the Greek letters and the bond when viewed down the bond axis. A sigma bond, \(\sigma\), resembles a similar "s" atomic orbital, and a pi pond, \(\pi\), has the same orbital symmetry of the p orbital (again, in both cases when viewed down the bond axis). Generally sigma bonds are stronger than pi bonds. Both are used extensively to predict the behavior of molecules in molecular orbital theory. Sigma bonds \((\sigma)\) are the strongest type of covalent bond, formed by head-on overlapping of atomic orbitals. Note that sigma bond has been referred to as the strongest type of covalent bond because the extent of overlap is maximum in case of orbitals involved in the formation of the sigma bond. Examples of sigma bonds with different types of overlap. Pi bonds \((\pi)\) are a type of covalent bond formed by sideways or lateral overlapping of atomic orbitals. 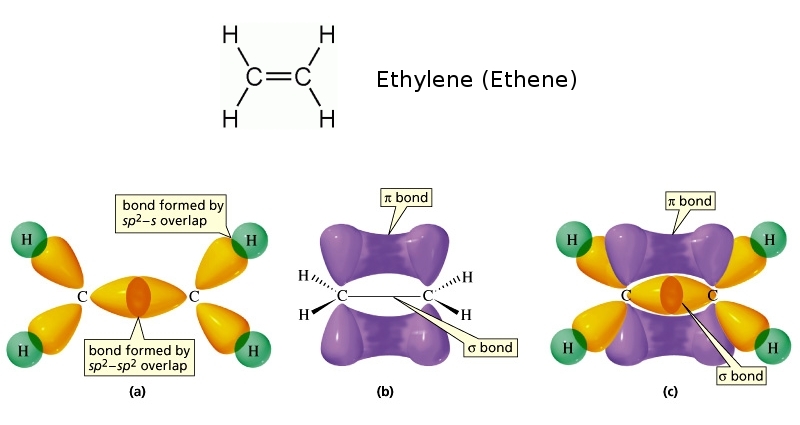 The figure below illustrates the sigma and pi bonds in an ethylene molecule (\(C_2H_4\)). Note that every single bond consists of one sigma bond, and that the double bond is made of one sigma bond and one pi bond. Likewise, a triple bond consists of one sigma bond and two pi bonds. Also observe how the sigma bonds are formed in between the atoms, and how the pi bonds are formed above, underneath, or beside the sigma bond. In general, the overlap of \(n\) atomic orbitals will create \(n\) molecular orbitals. 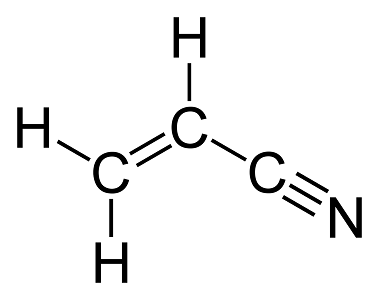 The following is the structure of acrylonitrile. Count the number of sigma and pi bonds in an acrylonitrile molecule. Note that there are four single bonds, one double bond, and one triple bond in an acrylonitrile molecule. Hence there are \(4+1+1=6\) sigma bonds and \(1+2=3\) pi bonds in this molecule. Which bond would you expect to break first in this molecule? Many covalent compounds contain multiple bonds (double or triple bonds). One difference between single and multiple bonds is that single bonds only have a sigma bond, whereas multiple bonds have both sigma and pi bonds. Like a double bond contains 1 sigma and 1 pi bond whereas a triple bond contains 1 sigma and 2 pi bonds. Multiple bonds affect the electronic effects of a molecule and can alter physical properties like boiling point and melting point. Multiple bonds are also useful for deciphering spectra obtained via nuclear magnetic resonance (NMR).